Andrea Tyrimos is a painter on the road to success - a glowing, urban, paint-driven road. After graduating from Central Saint Martins in 2009, she has been exhibiting her paintings ever since, and has just landed her first solo show at Curious Duke Gallery in East London. As the artist in residence at The Hoxton Hotel, Andrea Tyrimos will be painting live onto the walls of the hotel in the week leading up to the show. Her finished canvases will then be transported to the gallery for her exhibition, where a wall will also be waiting for her to paint directly onto during the weeks of the show. The exhibition, titled The Roadz, celebrates a unique meeting of live painting and lustrous urban landscapes, using oil paint to recreate city scenes of light, colour and fleeting moments from reality. We interviewed Andrea to find out about her inspiration, her favourite art materials and the steps she took to make it from art student to professional artist. Firstly – congratulations on your first solo show at Curious Duke Gallery! Could you tell us about it, and how it feels? It feels amazing, I'm really excited! I've always dreamt of having a solo show ever since I graduated. Having an entire gallery dedicated to my paintings feels like a dream come true. The Roadz is a culmination of my work so far, but it's also about exploring new themes. All of the paintings are London based; they’ve been described as having quite an urban, edgy feel to them, but I just like to paint what's around me. I like to show the beauty in the ordinary; I'm not an artist who paints dreamlike scenes, I prefer to paint reality. You take a lot of your artistic inspiration from Charles Baudelaire. How have his ideas affected your practice? It’s always been important for me to paint and depict what’s around me - modern life - and for a while I was searching for a concept behind my work without realising it had been there all along. Baudelaire’s notion of ‘The Painter of Modern Life’ really relates to me; he described the process of painting as ‘magical’ and believed that the product would inevitably carry the ‘essence and soul of their creator.’ I suppose I have a bit of a love affair with painting, and it’s a very romantic idea to think that every one of my paintings is a part of me. Can you tell us about the themes and processes behind your paintings? All of the work is new and exclusive to the solo show, and there are three themes all under the ‘Roadz’ umbrella. 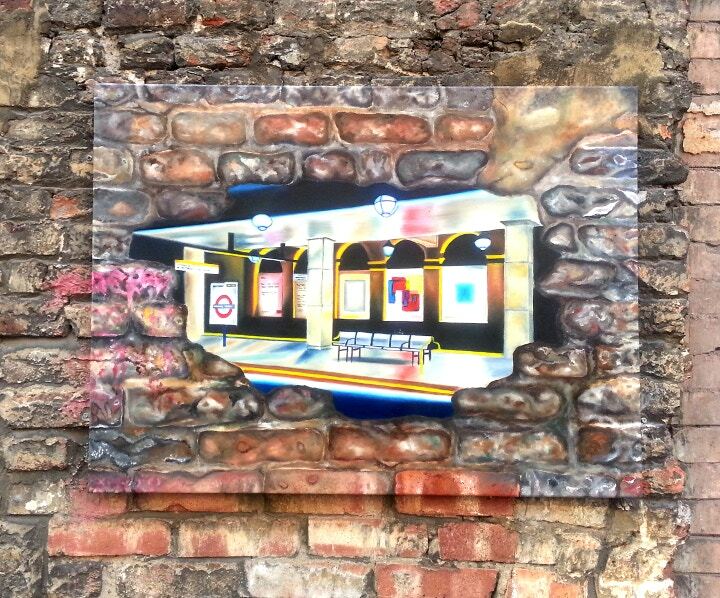 I have ‘City Lights’ which are urban landscape pieces, some pieces influenced by the Notting Hill Carnival, and finally the ‘Brick’ paintings; where I take to the streets of London and camouflage my paintings into their surroundings. I always start off with the experience. So whether I'm out with friends, driving around London, or walking my dog – when something catches my eye I'll record it. Then it’s a case of working out composition; so that as well as the painting being aesthetically pleasing, it’ll also have an element of ambiguity to it. I then get going with the painting, often changing it along the way. It’s a similar process with the Brick pieces, but for those I have to pay particular attention to the colour palette. How did art school prepare you for real life as a practicing artist? Saint Martins was, at times, really tough, but in hindsight I know that any struggles I went through made me stronger. You need a tough skin to be an artist, and I think it did help in making mine a little more resilient. To get to this stage, I just kept going. I've always believed that if you love what you do, it’s worth it. What is your favourite art material to work with and why? Although I paint modern scenes I only ever use traditional media – paintbrushes and oils. No matter what other materials I try, I always come back to this. So I would say that oil paints are my favourite art material, particularly the Michael Harding paints (which I actually buy from you guys at Cass Art!) The luminosity that the Harding paints have lend themselves very well to the bright and bold colour palette I use. Oh - and I've got a few battered old paintbrushes that I'm pretty attached to as well! Do you find that painting live is as important as the finished paintings themselves? Yes - I’ve loved interacting with the public with my Brick project. I think it’s great to make art more accessible, for people to be able to experience the process of a painting, the process of art. And finally – if you could give one piece of advice to art students wanting to make it as professionals, what would it be? 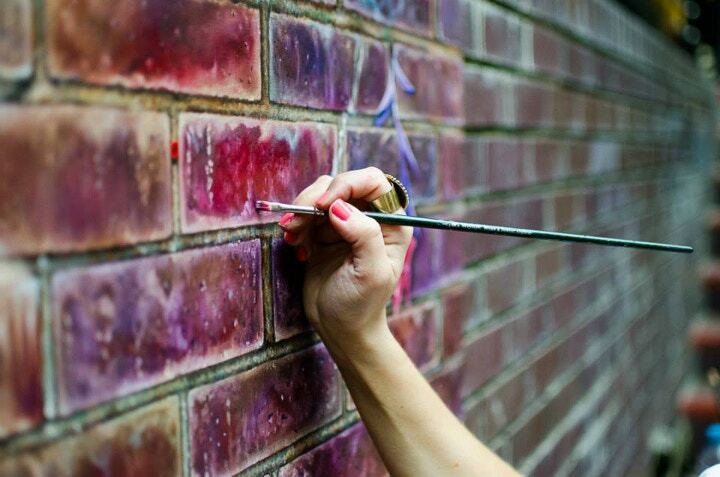 The Brick project has already seen a series of live painting events, most recently at the Barbican and WXSP. 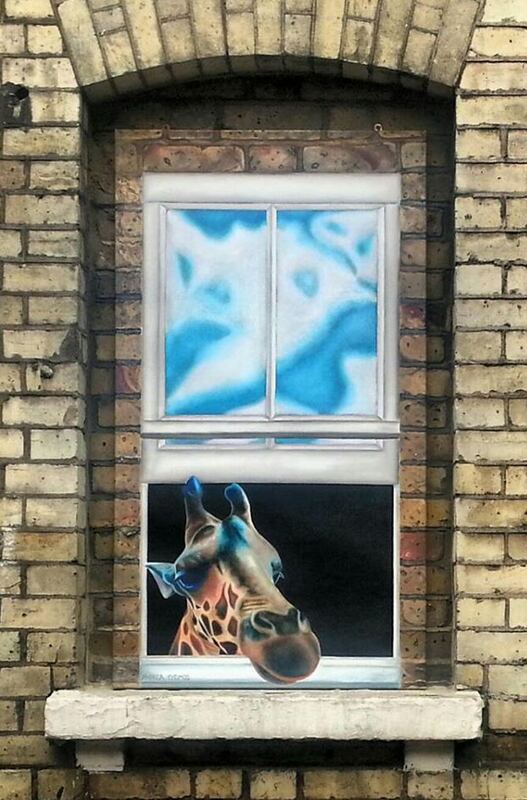 Tyrimos will be making another three photo-realistic oil paintings on canvas, that will blend into its brick surroundings in Shoreditch and Old Street - one of which is the one inside Curious Duke Gallery itself. Her exhibition, The Roadz, will be open from Thursday 5th June to Saturday 28th June at Curious Duke Gallery, 173 Whitecross Street, London. The Private View will be on Thursday 5th June from 6-9pm. Shop online for all your art materials, and view Andrea’s favourite Michael Harding Oil Paints to achieve a rich intensity of colour in your paintings. Buy the Cass Art Hog Brush Set of 6 to start your own oil painting now, and browse our range of canvases in both linen and cotton. Visit the Curious Duke Gallery website here and follow Andrea Tyrimos on Twitter. Tell us on Facebook and Twitter what you think of Andea's paintings and the idea of making painting an event.